Virgin America begins offering the service on its long-haul domestic flights. Remember when just making a phone call from 35,000 feet was amazing? Well, as of today, you can stream Netflix in the air as well—and it's free. 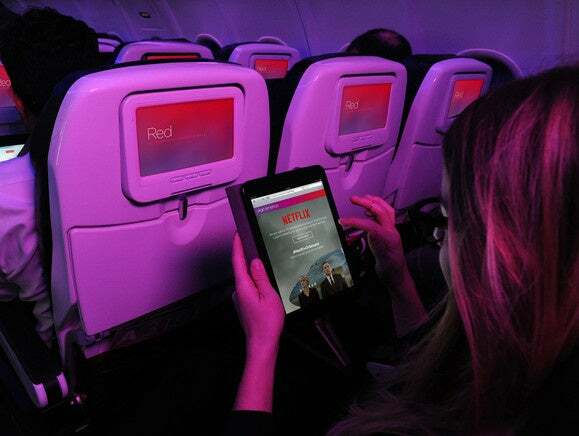 Virgin America became the first airline to offer Netflix via Wi-Fi, launching the service on Virgin America Flight 1 from San Francisco to Washington D.C. There's no real catch, content-wise; Virgin will allow you to stream the entire Netflix catalog to connected phones and tablets using its in-air Wi-Fi service. And that's what makes the magic happen. Earlier this month, Virgin struck a deal with ViaSat, to bring its Ka-band satellite service to its new fleet of A320 aircraft. That satellite technology boasts a whopping 140 Gbits per second per plane -- enough to stream Netflix to the aircraft and more. ViaSat promises that its new service will deliver Internet speeds that are typically 8 to 10 times faster than any other inflight WiFi system. Why this matters: Behind the scenes, airlines are wheeling and dealing to align themselves with content creators to improve their inflight entertainment options. In May, JetBlue said that planes equipped with its Fly-Fi service would be able to stream Amazon Prime content, which positions the two boutique airlines directly against each other. The ViaSat technology has been installed on the A320 flying the SFO-DCA route, and it will be added to one aircraft each month until June 2015. A hybrid Ku-band/Ka-band system will be installed on Virgin's Hawaii routes in 2016, the company said. To promote the new service, Virgin isn't charging for either the ability to connect to Wi-Fi or to Netflix until March 2. If your flight does have the improved Wi-Fi capabilities, Virgin flight attendants will announce it in the cabin. You'll then be able to open your browser and login for free by selecting the “VirginAmerica” ViaSat network. If you have a Netflix password, you'll apparently have to enter it again. Otherwise, you'll be offered a 30-day free trial that you can use immediately, Virgin said. Virgin will also offer all three seasons of "House of Cards" on its Red seatback IFE systems for free beginning next month, Virgin added. "For us, the future of streaming technology is about delivering an on-demand service that takes advantage of the expansion of WiFi to public places, parks, and now airplanes," Bill Holmes, the global head of business development at Netflix, said in a statement. It's hard to say exactly what the performance of Virgin's inflight network will be, especially with dozens of people trying to stream movies simultaneously. The great thing is that it essentially won't matter, as the service will be free for months.